Robert Pattinson succeeds in capturing our hearts without his vampire persona. 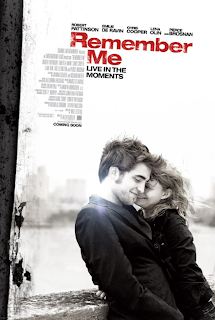 Remember Me is an unforgettable story about the power of love, the strength of family and the important of living passionately and treasuring every day of one's life. The chemistry between Robert and Emilie de Ravin is palpable and the ending will literally blow your mind. This is a love story for the ages, or for the R-Patz obsessed. Go now. Update: Bawled my eyes out. Literally, bawled. R-Patz's brooding is very reminiscent of Twilight's Edward but it was very fitting for the story.